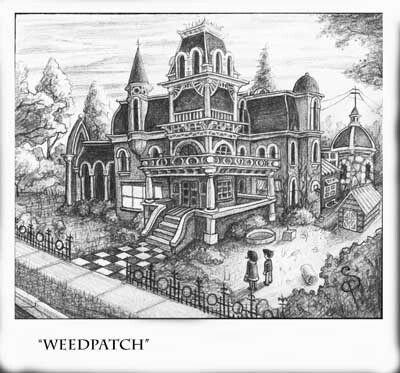 Weedpatch is the home of our aunt Katherine Peabody, eldest of the five Dripdry sisters, which includes Leona and of which our mother is the youngest. Set firmly in the heart of “The Void”, Weedpatch is a huge Victorian battleship of a house - once spectacularly grand, but now spectacularly ungrand. Gravy clots! It’s like Utah’s own accidental Winchester Mansion. Built in the 1870’s, with money made in Utah’s silver mines, it still dominates the neighborhood with its ornate tower, fancy roof trimmings, elaborate windows, wrap-around porches and balconies — all suffering now from chronic dilapidation. You’d expect to see bats flapping about the tower and widow’s walk. Well, on most summer nights you see just that, and lots of bats too. There’s a large yard surrounded by a low wrought-iron fence and now filled with unintentional booby-traps of collected this-and-that’s. The interior of the house, like the yard, is filled with anything and everything you can think of. Aunt Kate is a 10th degree certified lethal packrat. She collects EVERYTHING and throws nothing out, mountains of useless stuff. Weedpatch has a constant inflow of matter that must be just compacting and compounding — a black hole of sorts. In among the layered canyons of precariously piled packrat-archeology, a person can, here and there, discover attempts at interior decoration. The kitchen sports burlap covered walls, now greasy and peeling in shreds, and throughout the house on permanent display are decorations from every major US holiday. Once in October when I asked Aunt Kate why she hadn’t taken down some faded and cobwebbed Valentine’s decorations, she replied, “They promote love.” Aunt Kate is a very caring and loving woman and is beloved by many. She just glides in her own orbit. After a couple’a years of college she originally went the Mormon route, married young and popped out a billion kids. Then she got sidetracked and now exists in a perpetual state of sidetracked. Her husband, Uncle Prickles, seems to have gotten lost, deep in the trenches of Weedpatch. He hasn’t been seen or heard from in years. Cousins will randomly and mysteriously disappear and reappear. I’m pretty sure there are cousins I haven’t yet met. And I am absolutely convinced that Weedpatch is a portal to many elsewheres — parallel universes — other dimensions. Sometimes I worry about losing my way while inside and suddenly finding myself trapped in another world. Oom, however, worries about getting his clothes dirty. Still, Oom and I choose to spend almost more time at Aunt Kate’s house than we do our own.